Hand grenades were invented in 1915 and were rather unreliable but Harold Godfrey Bache's skill as a bowler must have been a great advantage. Harold Godfrey Bache was a pupil at King Edward’s School, Birmingham, from 1898-1908 where, for one term, he was in the same class as J R R Tolkien. His three brothers also served in the war. What defined Harold at school (and later at Cambridge University) was his love of and excellence in sports. 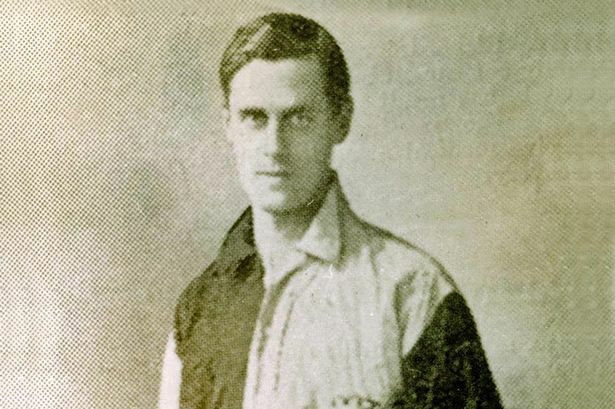 His skills were to lead Harold to play for both Warwickshire at cricket and for West Bromwich Albion at football. After volunteering for active service, Harold was trained as a ‘‘bombing officer’’. Originally with the 10th South Staffordshires, he became a Corporal but joined the 10th Battalion Lancashire Fusiliers as a Second Lieutenant. What these ‘‘bombers’’ actually did was throw grenades. Hand grenades were invented in 1915 and were rather unreliable but his skill as a bowler must have been a great advantage. In charge of 80 of these bombers, the story goes that in September of 1915, Harold was posted to a location close to Ypres, where some of the soldiers billeted in a barn came under shell-fire. One shell blasted through the roof, killing 20 and wounding 27 more. Harold dashed towards the barn with shells exploding all around him. He was ordered to take cover but still ran to men’s assistance. Harold was finally killed by a sniper on February 16, 1916 just after returning from an attempt to regain a lost trench. His body was never recovered but he is remembered on the Menin Gate. After his death, his brother John set up the Bache Memorial Fund in his memory. The fund paid for a permanent memorial in King Edward’s School, together with a cup which is still awarded every year to the best sportsman in the school.